Kids' rooms can be both the easiest and most challenging to decorate. On one hand, there are certainly countless companies that produce decor for children's spaces. There is no lack of options, and many visual decor themes are widely available thanks to specialty stores and the internet. On the other hand, you want to provide your child with wallpaper and furnishings that they will not only love now, but as they continue to grow and mature. This is the central challenge to decorating your child's room: keeping your design choices fresh and cost-effective while also keeping a weary eye on the fickleness of children. 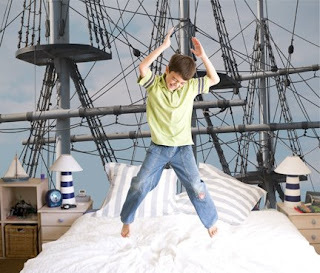 The nautical look, a classic boys room decor theme, is one that we have easily updated to maintain your child's appreciation of his decor and wallpaper for years to come. Oftentimes nautical decor is boring in it expectedness; cartoon life preservers, buoys, and anchors thoughtlessly mashed together on wallpaper and wallpaper borders. This look is stale out of the box, and your son will certainly lose most if not all interest in his decor shortly into his early tween years. Substitute the common nautical wallpaper with a bold custom wallpaper wall mural. In the image above, we focused on larger elements, three sail masts with criss-crossing rigging. The striking nature of the image gives it a modernity that you'd never find in a wallpaper catalog. This updated wallpaper look can easily continue to interestingly work with your child's evolving room decor, even as other previously treasured lamps, rugs, and other pieces fall to the wayside. With so many image choices available, let us assist you in finding just the right image for a mural in your son's nautical inspired room. Or, if you have your own picture of a beautifully colored sail boat or related object, submit it to see if it can be used for a custom wall mural that no other child will have. Really like the idea with the ship in the backroom. Very creative ideas.